(Hong Kong, 19 March 2019) Hip Shing Hong (Holdings) Company Limited (“Hip Shing Hong” or “The Group”) is delighted to announce that it has been awarded the “15 Years Plus Caring Company Logo” organized by the Hong Kong Council of Social Service (“HKCSS”) in recognition of its commitment to care for the society, employees and the environment over the 15 consecutive years. Hip Shing Hong is dedicated to making contribution to society and promoting corporate social responsibility in various aspects. In term of caring for the society, the Group motivates staff to participate in volunteering and help alleviate the difficulties faced by the underprivileged community. Last year, the Group took part in the pilot programme “Big Little Things Innovation Challenges” organized by Business for Social Good of Our Hong Kong Foundation and became one of the first batch of corporations to provide simple yet creative solutions to improve the living environment of the grassroots community. To stress on the physical and mental health of employees, work-life balance policies have also been carried out and diversified activities have been regularly organized to create a healthy workplace environment. Other than that, Hip Shing Hong has put great efforts in promoting sustainability by advocating green lifestyle and adopting energy-saving measures, which have been constantly recognized by a number of green organizations. The Caring Company Scheme was launched by the HKCSS in 2002 with the objectives of fostering strategic partnerships between the business and social services sectors, encouraging corporations to take up social responsibility and creating a more inclusive society. Hip Shing Hong has been awarded the “15 Years Plus Caring Company Logo” by the Hong Kong Council of Social Service. 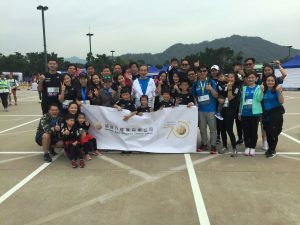 Hip Shing Hong encourages employees to participate in different charitable sports events to raise funds for charities and cultivate a healthy lifestyle. Hip Shing Hong is devoted to promoting sustainability and educating the next generation about green living. Founded in 1948, Hip Shing Hong (Holdings) Company Limited (“Hip Shing Hong”) is an astute property developer based in Hong Kong. With over 70 years of extensive experience in the industry, Hip Shing Hong has actively developed, built and acquired a well-diversified portfolio of properties, which consists of full serviced office spaces, upscale residential complexes, smart industrial buildings, retail stores, hotels and serviced apartments, and urban revitalization projects. Hip Shing Hong is fully rooted in corporate social responsibilities since the early 1960’s and has donated over 500 charitable projects. In recent years, Hip Shing Hong has earned numerous accolades, including “15 Years Plus Caring Company Logo”, “CarbonCare Champion Label”, “Hong Kong Outstanding Corporate Citizenship Award”, “Meritorious Family-Friendly Employers”, “WGO Green Office Label” and “UNMDGs Better World Company Label”. Hotel Madera Hong Kong, an affiliate of Hip Shing Hong, captured Silver Award in “Hotels and Recreational Clubs” sector at “Hong Kong Awards for Environmental Excellence” etc. Hip Shing Hong has also achieved recognitions in other areas, such as “The 12th China Golden Awards for Excellence in Public Relations Silver Award”, “HKMA Quality Award”, “Best Office Architecture Award”, etc. For details, please visit www.hshd.com.hk. COPYRIGHT © 2017 HIP SHING HONG (HOLDINGS) COMPANY LIMITED. ALL RIGHT RESERVED.